This summer we decided to sort out the garden in front of our house. I couldn’t have spent another month mowing the lawn every week, something had to be done! The lawn in summer grows quickly anyway but, this summer it’s gone bonkers. We’ve had week after week of hot weather and mowing the grass became such a chore. We both work full time and just don’t have the man hours to be mowing every week. 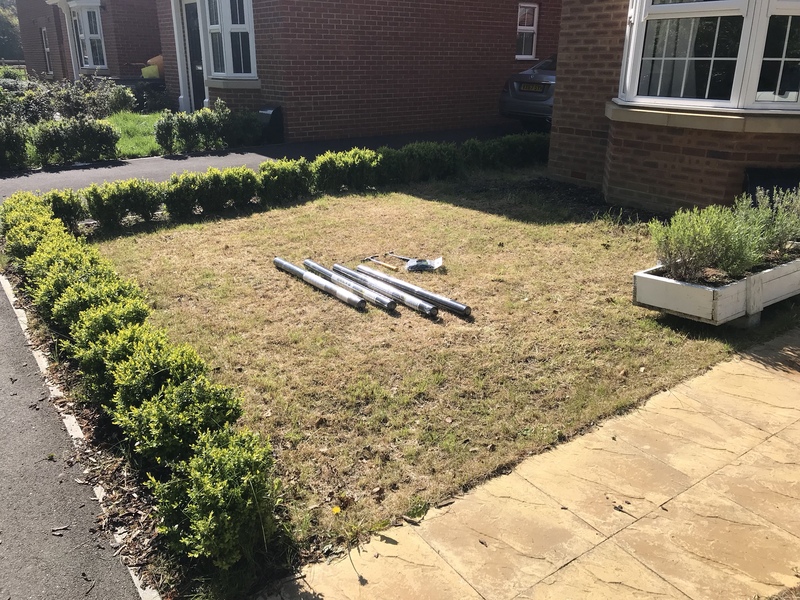 So I came up with a solution on a budget to fix up the front garden. The area was just lawn with a box hedge lining the edge so thankfully it did not require much preparation. First of all I cut the grass back really hard and covered the lawn in weed killer, which cost £10, two days before we started the project. Here’s the garden looking very yellow before we started work. When I say we, of course Henry was my partner in crime in the mission to tidy up the front of our house. 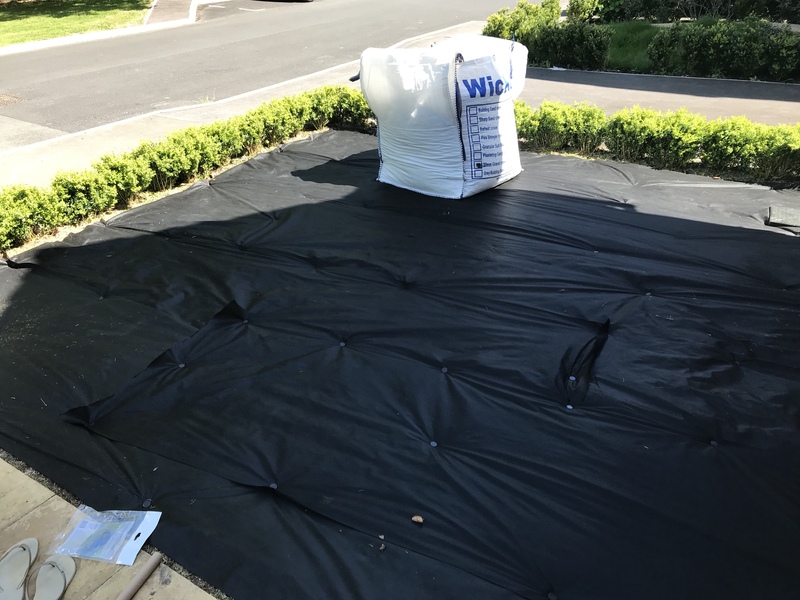 First of all we covered all the grass by putting down a weed resistant liner and pinning it in place. Each roll was around £5 from B&Q, some were in the sale and some were full price and we used about six rolls and eight bags of plastic pegs, £3.99 a pack, to keep them in position. We needed a few more pegs than expected so there were several trips back to B&Q for extra packs. This was actually the quickest part, it only took about two hours to get it laid and pegged in place. It was lucky as our Wickes delivery of gravel arrived mid-morning, thank god I woke up early and got cracking! The crane that delivered the ton of stones was huge and straddled the drive and half the street! There was going to be no moving it once it was down. Then it was time to start spreading the stones, so we just split the bag and started raking them out. I thought this wouldn’t take long but actually it took forever. Unfortunately we’d both severely underestimated the amount of gravel required. So it was back to B&Q again to be able to complete the front. 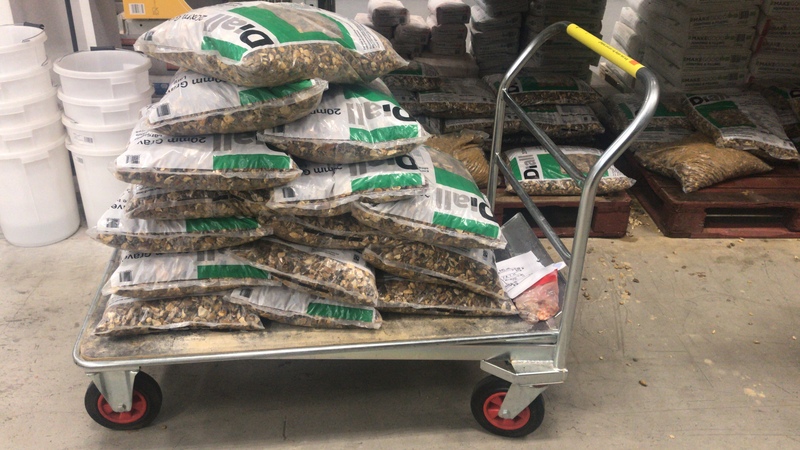 I had to fill my poor little car up with 15 bags of gravel which made for the slowest journey home ever. I won’t be doing that again in a hurry! This cost us around £45 but was so worth it so the majority of the garden is complete. Despite buying more stones we still haven’t got enough to complete this long section by the house. Stones are crazy expensive so we’re going to have to wait to get this finished. 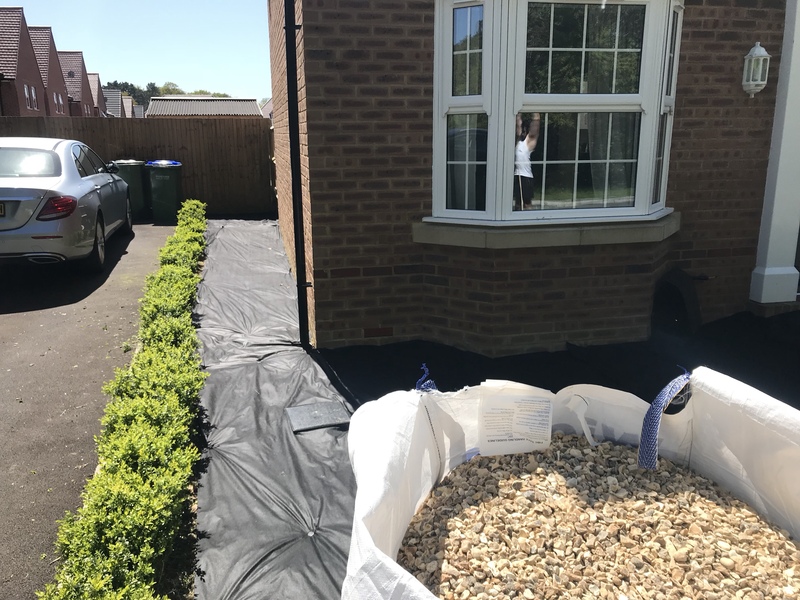 It’s a bit annoying but most of it is covered and thankfully you can’t really see this when you look at the front of the house! After all the stones were laid we got to work on my home-made planters. I rescued these from the wood reclamation project in Southampton and got three similar sized crates for £30, and spent time fixing them up with scraps of wood I’d saved, a lot of wood glue and nails. 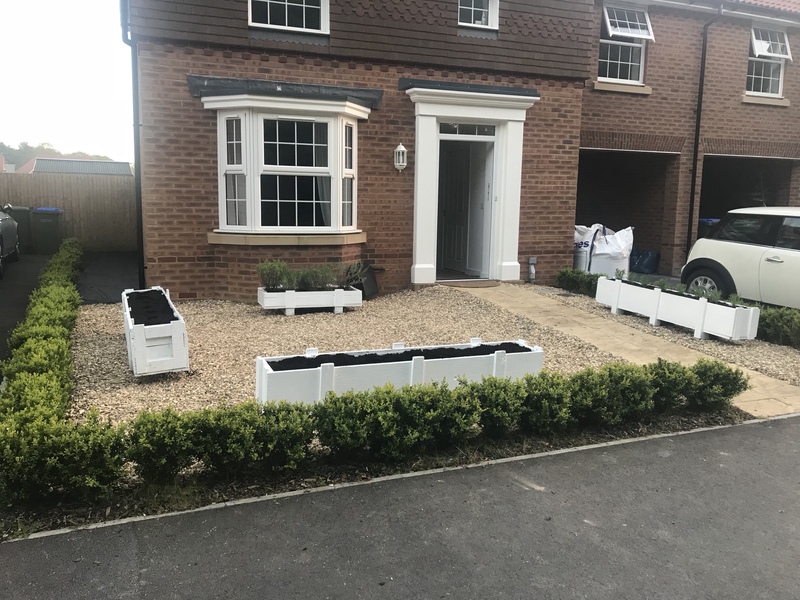 I painted them with outdoor furniture paint £15, lined them porous planter liner which was £1 a pack from Home Bargains and we used two and some I had left over in the shed. I wanted plants that required little upkeep, would flower, smell and be good for bees. 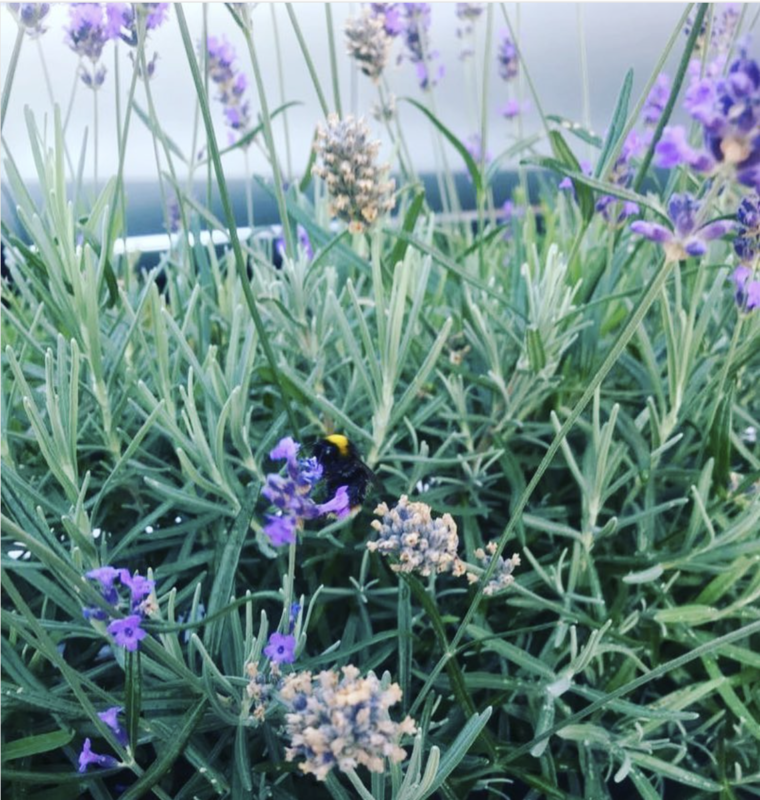 Lavender turned out to be the perfect option and during the summer there was an offer where you could get eight baby lavender plants for £7. We bought three packs for each planter we had which filled them perfectly. The soil to fill the planters was also a little more expensive than we originally thought. 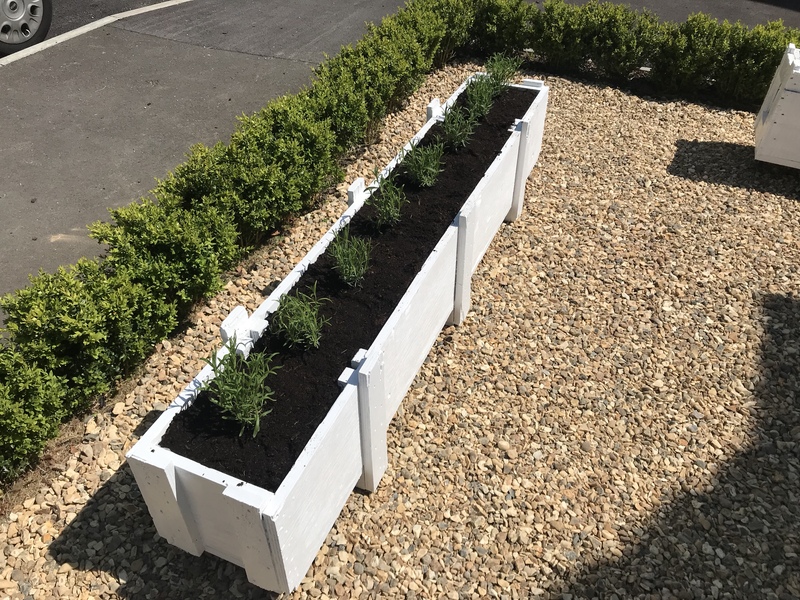 We bought six 125L packs of Verve Muktipurpose compost for £6.93 each and these filled the planters with just a little to spare. We had to position the planters before we filled them because they would have been too heavy to move. But, once all three were in place and filled it really added the finishing touches to the new garden! 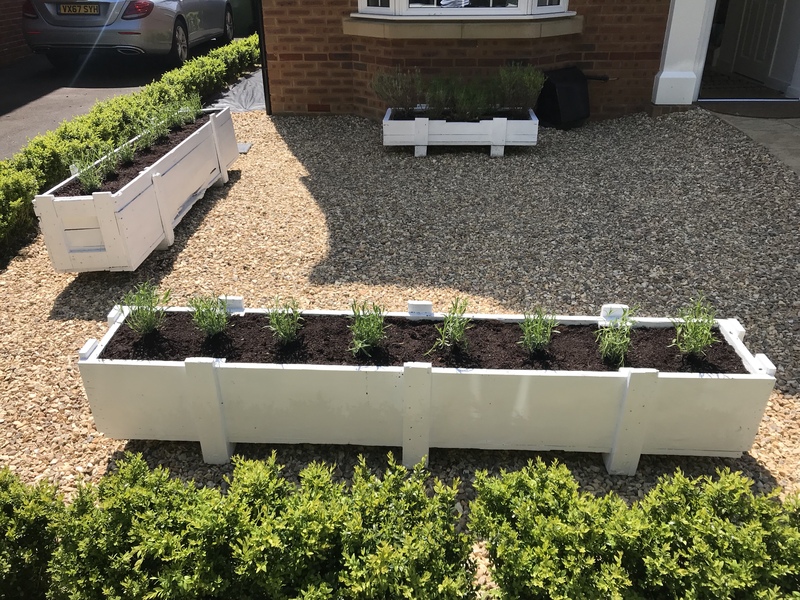 The planters in place with soil but no lavender at this stage! The fourth planter, the smaller one at the back is one I made when we first moved into the house. I’d pulled out the horrible flower bed that had been filled with a real odd mix of plants out and it looked a bit bare. That’s when I got the first inspiration to make my own planters! 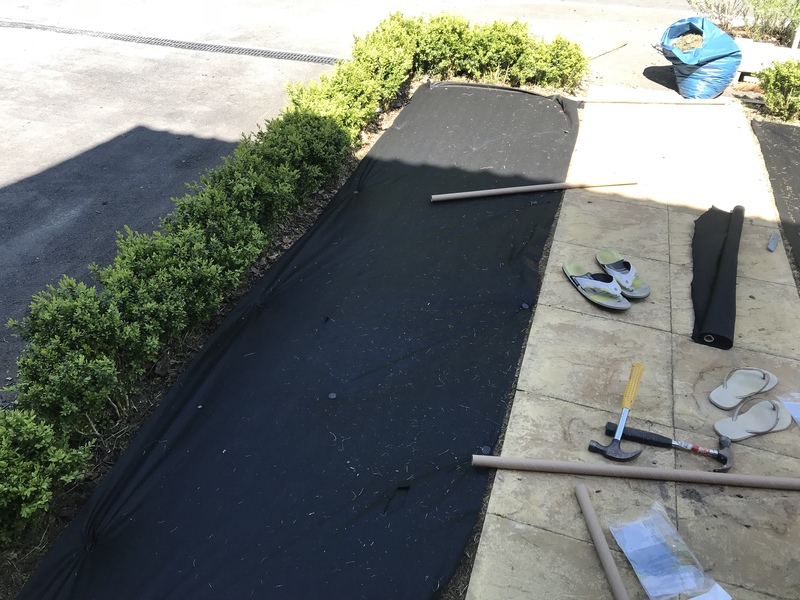 It took just over a day and a little over £200 to do our big garden project, thankfully the weather was warm so the only delays came from the many trips to B&Q. I am so happy we no longer have to mow and ever since the plants have started to flower we’ve had so many bees. Seeing it every morning on my way to work fills me with so much happiness. Let me know what you think of the garden! Have you ever done any garden projects? Any tips or additions I can make? I’m thinking of adding a few pots around the planters with seasonal flowers in them.